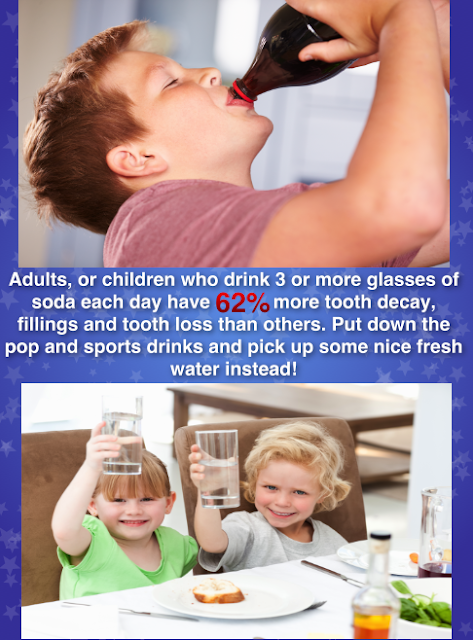 Practice good Oral health with good habits for a successful life! 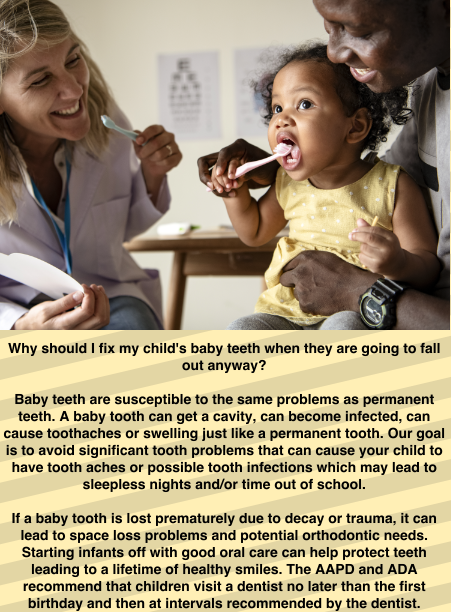 Your Child's baby teeth are just as important! 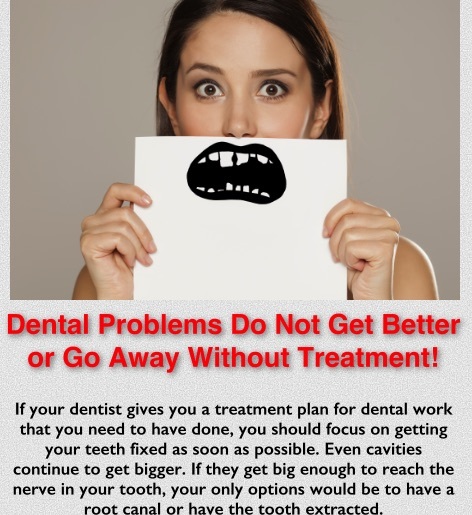 Ignoring your Dentist's treatment plan is like eliminating your Smile! Although going to the Dentist is not something anyone really looks forward to, the fact still remains that Oral Health is not just casual maintenance to the part of the body that feeds you, or helps you communicate to the world. 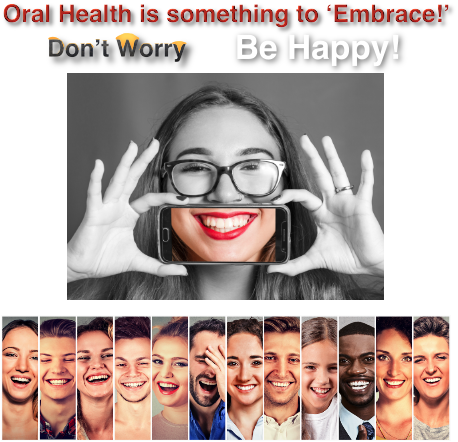 Besides all the commonly discussed factors of scenarios that can arise from poor Oral health, there are the crucial outcomes that affect us in many areas of our livelihood. 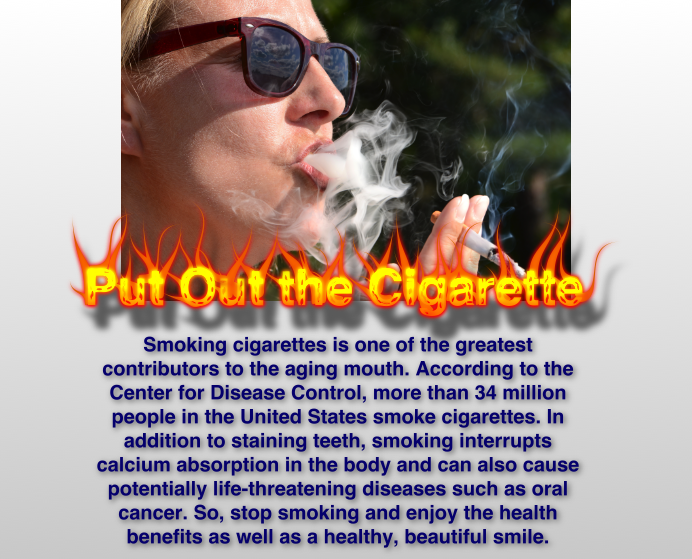 Those who care about their oral hygiene benefit in so many ways! Everyone should really think it through before deciding if investing in your smile, is worth the bother. 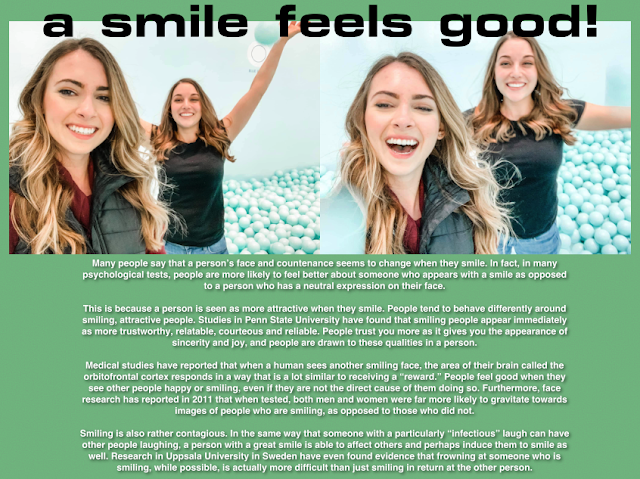 Ever think about the pictures where there are those individuals who you never see ‘smiling’? The typical assumption is that they are just not happy, or do not like their picture taken. This sends a very negative message and certainly does not introduce opportunity in most businesses that require someone with an engaging personality. Smiling inhibits a welcoming invitation and also compliments others that you interact with. Smiling is a respectful display of consideration and politeness. It will always leave a lasting impression to everyone you encounter. Smiling is also a privilege that promotes inner confidence and positive outcomes. Imagine if we did not have a set of teeth to show off when we are happy or experience laughter! The choice is simple to recognize the enormous value of good Oral health and how your life depends on it. 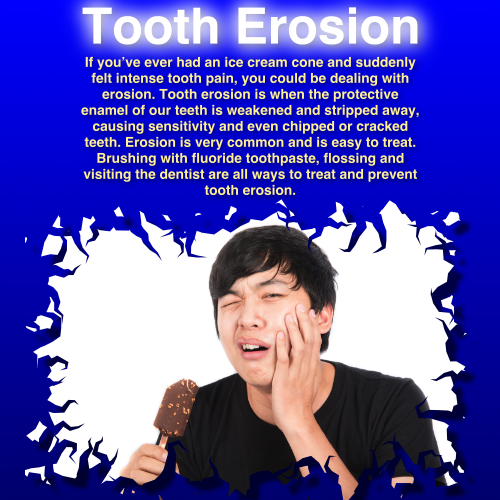 It also reassures you that your mouth does not become a haven that promotes or approves other infections and disease from entering your body. This is something just as important as locking your door, protecting your children, or making sure you have a roof over your head. So next time you look at your schedule and see that you have a Dentist appointment, remember how good it is to know you make a difference with your future, and how happy you are that you can show your smile! Many of us in our busy schedules and lifestyles struggle to keep up with all the insurances and policy details that we actually pay for. We keep our insurance cards buried with all of our other membership cards, credit cards, retail shopping points cards etc. As going to the Dentist is not a common routine, we often do not know much about our dental insurance policy or details of coverage. It's not fun when we are asked questions about coverage that we cannot answer. So you're standing at the reception desk scrambling for what looks like your dental insurance card. "Is this it? " or "Oh here, how about this one". This can quickly turn into some unplanned embarrassment that just makes your experience at the dentist more stressful. It all comes down to one issue. Before you go to your next office appointment, look through all your cards, find your policy and do some simple research. Call your insurance company and ask how to find out your coverages. See if you can login to an insurance portal and see everything for yourself. Find out what insurances are excepted at your dentist office. Just be prepared and you will make your life a lot easier. Know your coverage and decide what is best for you and your family! Most people associate going to the Dentist for things like a new filling, a root canal, an implant, or maybe even braces. Sure these are all very important services that only a Dentist can perform, but a ‘Teeth Cleaning’ appointment should come first. There are many people who put off going to the Dentist for years. As long as nothing hurts, everything is ok, right? Well, not so. There can be all sorts of issues that need attention before other complications will take over. Looking in the mirror won’t tell you everything you need to be aware of. This appointment is the moment for some valuable consultation and treatment plans to address the issues of preventative care. Advice on proper brushing techniques, flossing, and most importantly where you stand with what may need attention today! I found out I was brushing my teeth too hard and my gums are receding. My Dentist explained to me that a gentle brushing technique and a soft bristled brush is the only thing I need. I floss everyday , but now I found out there are also other options that are quite effective such as a Hydrofloss that actually magnetizes the water making it possible to remove a hardened dental plaque called “calculus”. Well now I want to know more about this! The truth is the only way I’ve come to know any of this, is because I went to my ‘Teeth Cleaning’ appointment. And now I have become a little wiser. Your Dentist can explain everything to you so you’re not spending your time ‘guessing’ and wondering where you stand. Do yourself a favor- Go get your teeth cleaned! G O T F L O S S ? The first nationally representative analysis designed to determine how many people floss their teeth, found that those who floss daily amount to about 30 percent of the population. 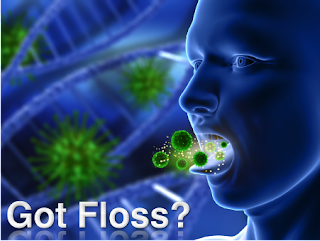 Just over 37 percent report less than daily flossing, and slightly over 32 percent say they never floss. Wow! That’s just crazy! There are so many other topics of healthcare, fitness, and bad habits etc. out there that everyone is always yammering about, but this subject looks like something that is severely neglected! But don’t take my word for it. Let’s just take a look at some clear details of this topic. This is a rather raw version of the truth, but when you eat, food gets lodged in between your teeth and gums. You say, “Hey I brush my teeth everyday”; well that’s great, but it doesn’t get rid of trapped food that will soon become a haven for bacteria growth just after 24 hours. It’s no different then the table scraps that you discard into your garbage can as you complete your routine clean-up in the kitchen after every meal. What happens to that food that is thrown away? Well it joins the rest of the garbage and now will rot and produce massive amounts of hideous bacteria that will soon inherit a very unattractive ‘stench’ that gets worse as the days go by. The garbage just keeps piling up until you take it out to the curb to be picked up by a very noisy vehicle in the early hours of the morning. So with your teeth, unless you floss on a daily basis, you are doing nothing more than ‘hoarding’ your own garbage, and you continue to go from day to day as it rots as well. Hmmm, could that possibly cause ‘bad breath’? You betcha! And depending on how long you go without flossing, you have been doing nothing more that mixing the new garbage with the old. I think you get the picture. So when it comes to taking out the garbage, YOU are the ‘garbage man’. That’s right. You can prevent all of this from happening! Just think next time you walk up to some folks and deliver your big ‘Hello’. You have probably been including something you didn’t intend to offer. A foul stench that won’t soon be forgotten! You can use floss, use an oral irrigator, or interdental brushes. Remember, you are just taking a few moments to get rid of leftover food particles so you aren’t taking out the ‘Garbage’ because someone has alerted you of your fowl breath! Flossing is a preventative measure to keep your mouth healthy and odor free!